Germany: At the National Socialist first party congress held at Weimar, Germany, Hitler's personal authority over the party is accepted by the majority and his position of party Fuhrer is formally approved. Spain: Day 353 of 985 of the Spanish Civil War. Spain: Day 718 of 985 of the Spanish Civil War. CBI - China: Day 363 of 2,987 of the 2nd Sino-Japanese War. Day 24 of 139 of the Battle of Wuhan. USA: Lou Gehrig gives his famous "Today, I consider myself the luckiest man on the face of the earth." speech. CBI - China: Day 728 of 2,987 of the 2nd Sino-Japanese War. Day 21 of 68 of the Battle of Tianjin. CBI - Mongolia: Day 55 of 129 of the Battle of Khalkhin Gol, a border dispute between the Soviet Union and Japan. UK: Winston Churchill receives his first standing ovation in the House of Commons as the Prime Minister of the United Kingdom after delivering a speech justifying the attack on French warships. Atlantic: German Stukas and motored torpedo boats attack a British convoy south of Bournemouth, England, near Portland, sinking 5 merchant ships. ETO - UK: The Dame of Sark, ruler of the island of Sark in the English Channel, surrenders to German troops. ETO - France: In direct response to the devastating British attack on the French fleet at Mers-el-Kebir, the Vichy French government of Marshal Pétain breaks off diplomatic relations with Britain. MTO - Egypt: Italian bombers raid on Malta and at Alexandria. MTO - Algeria: The British sub HMS PANDORA sinks the French gunboat RIGAULT DE GENOUILLY off Oran. French bombers attack the British fleet at Gibraltar, causing no damage. East Africa: Day 25 of 537 of Italy's East African campaign in the lands south of Egypt. Italian troops capture a number of British forts, including Kassala and Gallabat on the Sudanese border. CBI - China: Day 1,094 of 2,987 of the 2nd Sino-Japanese War. Day 233 of 381 of the Battle of South Guangxi. USA: In an Independence Day broadcast, Roosevelt warns the American public that the USA, "will never survive as a happy and prosperous oasis in the middle of a desert of dictatorship." UK: British Communist Party decides to stop campaigning for peace and instead will support the national war effort. Russian Front - Finland: Day 6 of 142 of Operation SILVER FOX, a joint German-Finnish campaign to capture the Russian port of Murmansk in the Arctic. Russian Front - Finland: Day 4 of 140 of Operation ARCTIC FOX, a joint German-Finnish campaign against Soviet Northern Front defenses at Salla, Finland. Russian Front - Finland: Day 13 of 164 of the Battle of Hanko. Russian Front: Day 13 of 167 of Germany's Operation BARBAROSSA, the invasion of the USSR. Russian Front - Center: German Army Group Centre captures Ostrov in northern Russia. Russian Front - South: Day 3 of 21 of the Battle of Bessarabia, Russia. German and Romanian troops continue their attack at Bessarabia to take the land and city that Romania was forced to cede to the USSR a year ago. MTO - Libya: Day 86 of 256 of the Siege of Tobruk. Middle East: Day 27 of 37 of the Battle for Syria and Lebanon. East Africa: Day 390 of 537 of Italy's East African campaign in the lands south of Egypt. CBI - China: Day 1,459 of 2,987 of the 2nd Sino-Japanese War. Atlantic: Day 8 of 14 of Germany's Hunt for Allied Convoy PQ-17. During this hunt, U-boats and the Luftwaffe will sink 24 merchant ships. Today's raids claim 9 ships as the convoy commander orders the convoy to scatter. ETO - Germany: The RAF makes their third 1,000-plane raid in Germany, hitting at Bremen. ETO - Netherlands: The US 8th Air Force flying A-20s join the RAF in a joint attack on airfields in the Netherlands. Germany: The Auschwitz Concentration Camp begins mass gassings. Russian Front - North: Day 300 of 872 of the Siege of Leningrad. Russian Front - North: Day 61 of 658 of the Siege of the Kholm Pocket. Russian Front - Center: Day 3 of 22 of Germany's Operation SEYDLITZ, a plan to trap and capture numerous Soviet troops. Russian Front - South: Day 248 of 248 of the Siege of Sevastopol, Crimean Peninsula. German troops secure the city. Russian Front - South: Day 7 of 27 of the Battle of Voronezh, Russia. Russian Front - South: Day 7 of 150 of Germany's CASE BLUE, the failed offensive to take the Caucasus oil fields. MTO - Egypt: Day 4 of 27 of the 1st Battle of El Alamein. While Rommel is waiting for more tanks and supplies to be brought up, the British 8th Army makes a series of attacks. MTO - Libya: US B-24s bomb the harbor at Benghazi. East Africa: Day 61 of 186 of the Battle of Madagascar. CBI - China: Day 1,824 of 2,987 of the 2nd Sino-Japanese War. Day 51 of 124 of Japan's Zhejiang-Jiangxi Campaign, launched to punish anyone suspected of aiding the Doolittle raiders in China. Roughly 250,000 Chinese will be killed. The 1st American Volunteer Group, aka The Flying Tigers, is disbanded and ushered into the newly activated China Air Task Force under command of Brigadier General Clare L Chennault. The old unit destroyed 300 Japanese planes since 20 Dec 41, while losing only 14 pilots on combat missions. Wasting no time, they immediately bomb the airfield at Tien Ho and shoot down 13 enemy planes over Kweilin. PTO - Alaska: Day 28 of 435 of the Battle of Kiska, Aleutian Islands. PTO - Malaya: Day 136 of 357 of the Battle of Timor Island. PTO - New Guinea: US 5th Air Force bombs airfields at Lae and Salamaua. PTO - Solomon Islands: Allied reconnaissance reports that the Japanese have begun building an airfield on Guadalcanal. ETO - UK: Journalist John Steinbeck of the New York Herald Tribune newspaper spends a day with British airmen at an airfield in England. His experiences on this day will later be found in his work "Once There Was a War" in a chapter titled "Waiting." ETO - France: US 8th Air Force B-17s bomb aircraft factories at Le Mans and Nanes, while other B-17s hit the submarine yards at La Pallice. Russian Front - North: Day 665 of 872 of the Siege of Leningrad. Russian Front - North: Day 426 of 658 of the Siege of the Kholm Pocket. Russian Front - South: Germany relaunches Operation CITADEL, aimed at encircling and destroying Soviet troops in the Orel-Belgorod salient near Kursk. However, the Soviets are launching their own offensive. MTO: General Sikorski and other members of the Polish government-in-exile are killed in a plane crash in Gibraltar. Sabotage is suspected, but is never proven. MTO - Italy: US 9th and 12th Air Forces bombs several targets in Sicily and Italy. CBI - Burma: US 10th Air Force attacks the Shweli road bridge, but fail to cause appreciable damage. CBI - China: Day 2,189 of 2,987 of the 2nd Sino-Japanese War. PTO: The USS SNOOK attacks a Japanese convoy, sinking the cargo ships KOKI MARU and LIVERPOOL MARU and damaging the ATLANTIC MARU. PTO: The USS POMPANO sinks the Japanese seaplane carrier SAGARA MARU. PTO: Day 39 of 47 adrift in a raft for the survivors of B-24 GREEN HORNET that crashed 850 miles from Hawaii. PTO - Alaska: Day 393 of 435 of the Battle of Kiska, Aleutian Islands. PTO - New Guinea: Day 74 of 148 of the 2nd Battle of Lae-Salamaua. US 5th and 13th Air Forces provide air support. PTO - Solomon Islands: Day 15 of 67 of the Battle of New Georgia. US 5th and 13th Air Forces provide air support. US Marines and US Army troops secure Kaeruka and Cheke Point on Vangunu Island, just southeast of New Georgia. The Japanese make their last large daylight air raid on Rendova. ETO - France: Day 29 of 49 of Operation OVERLORD, the Allied invasion of Normandy, France, known forever simply as D-Day. D-Day+28: Troops and supplies continue to pour in, including US nurses assigned to field hospitals to care for wounded soldiers. To give an idea of how hard the fighting is, today one US Division gains just 200 yards and captures 6 Germans in exchange for taking almost 1,400 casualties. 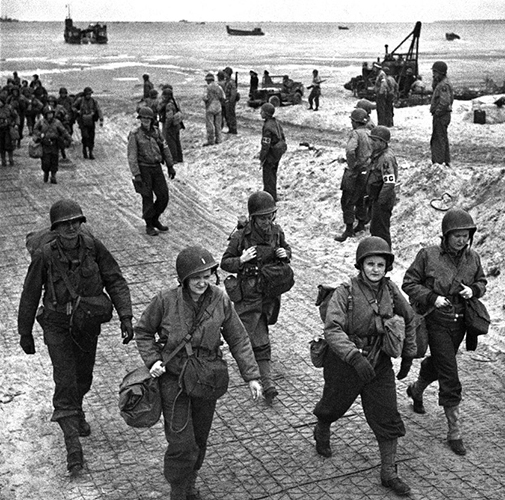 More than 59,000 American nurses served in the Army Nurse Corps during World War II. Nurses worked closer to the front lines than they ever had before. 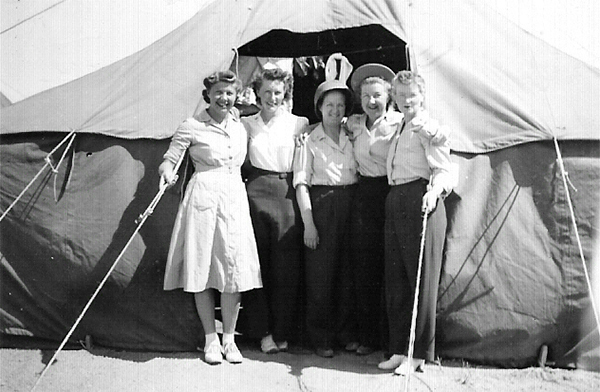 Within the "chain of evacuation" established by the Army Medical Department during the war, nurses served under fire in field and evacuation hospitals, on hospital trains and ships and as flight nurses on medical transport planes. The skill and dedication of these nurses contributed to the extremely low post-injury mortality rate among American military forces in every theater of the war. Overall, fewer than 4 percent of the American soldiers who received medical care in the field or underwent evacuation died from wounds or disease. 01 Jun 41: Red Cross unifies services as "Services to Armed Forces"
ETO - UK: Day 22 of 86 of the V-1 "Buzz Bomb" offensive on Britain. ETO - France: Day 29 of 62 of the Battle of Caen. ETO - Denmark: The general strike in Copenhagen ends with the Germans rescinding their curfew to avoid future such uprisings in Denmark. Germany: With intelligence obtained by infiltrating the meeting in Berlin on 22 June 1944 between Claus von Stauffenberg and German communists, the Gestapo makes several arrests. Russian Front - Finland: Day 10 of 15 of the Battle of Tali-Ihantala. This becomes the largest battle in Scandinavian history. Russian Front - Finland: Day 14 of 50 of the Battle of Karelia. Soviet troops continue their offensive against the Finns in eastern Karelia between Lake Ladoga and Lake Onega in northern Russia. Russian Front - North: Day 154 of 191 of the Battle of the Narva Isthmus, Estonia. Both German and Soviet troops remain locked in their defensive positions. MTO - Italy: Day 19 of 34 of the Battle of Ancona (north of Rome). Allied Air Forces provide air support. The US 5th Army clears parts of Rosignano, overrun Mount Vitalba and push into Casole d'Elsa. CBI - Burma: Day 122 of 166 of the UK's Operation THURSDAY. US 10th Air Force provides air support. CBI - Burma: Day 117 of 147 of the Battle of Myitkyina. US 10th Air Force provides air support. CBI - Burma: Day 95 of 302 of the Chinese Salween Offensive. US 14th Air Force provides air support. CBI - China: Day 2,555 of 2,987 of the 2nd Sino-Japanese War. Day 79 of 259 of Japan's Operation ICHI-GO. Day 13 of 48 of the Battle of Hengyang. US 14th Air Force provides air support. CBI - India: Japanese General Wazakazu Kawabe officially terminates Operation U-GO. PTO: Radio communications between the USS S-28 and US Coast Guard cutter RELIANCE is broken and the USS S-28 is never heard from again. PTO: In the morning, the USS TANG sinks the Japanese freighter ASUKAZAN MARU and in the afternoon sinks the transport YAMAOKA MARU. PTO - Caroline Islands: US 7th Air Force B-24s bomb Truk Atoll. PTO - Dutch New Guinea: Day 3 of 61 of the Battle of Noemfoor. The airfield at Yebrurro is secured by US troops. PTO - Mariana Islands: Day 20 of 25 of the Battle of Saipan. US 7th Air Force provides air support. PTO - New Guinea: Day 39 of 83 of the Battle of Biak. There are still 3,000 Japanese soldiers on the island who won't give up. PTO - New Guinea: Day 203 of 597 of the Battle of New Britain. US 13th Air Force provides air support. PTO - New Guinea: Day 74 of 481 of the Battle of Western New Guinea. 5th Air Force provides air support. PTO - New Guinea: Day 21 of 80 of the Battle of Lone Tree Hill. PTO - Solomon Islands: Day 247 of 295 of the Battle of the Bougainville Islands. US 13th Air Force provides air support. UK: Canadian troops begin a riot in Aldershot, England, in protest against the delay in shipping them home after their service in Europe. Around 500 troops are involved, although little damage is caused and no one is seriously injured. Germany: The British 7th Armoured Division, aka The Desert Rats, enters Berlin to establish the British sector. CBI: US 14th Air Force attack targets in French Indochina and southern and eastern China. CBI - China: Day 2,920 of 2,987 of the 2nd Sino-Japanese War. PTO - Alaska: To celebrate the 4th of July, US 11th Air Force B-24s bomb the Kataoka naval base on Shimushu Island with Napalm bombs. PTO - Borneo: Day 25 of 67 of the Battle of North Borneo. US 5th and 13th Air Forces provide air support. PTO - Dutch East Indies: Day 4 of 21 of the 2nd Battle of Balikpapan. PTO - Japan: US 20th Air Force attacks the Yokosuka naval base and airfields in the Tokyo area. PTO - New Guinea: Day 555 of 597 of the Battle of New Britain. US 10th Air Force provides air support. PTO - New Guinea: Day 439 of 481 of the Battle of Western New Guinea. US 10th Air Force provides air support. PTO - Philippines: Day 257 of 299 of the 2nd Battle of the Philippines, aka the Liberation of the Philippines or the Philippines Campaign. PTO - Philippines: Day 202 of 244 of the Battle of Luzon. The battle is said to over but hold-outs will continue fighting for a couple of more months. PTO - Philippines: Day 117 of 159 of the Battle of Mindanao Island. The battle is said to over but hold-outs will continue fighting for a couple of more months. PTO - Philippines: Day 109 of 135 of the Battle of the Visayas region. The battle is said to over but hold-outs will continue fighting for a couple of more months. USA: The Philippine Islands is granted independence by the United States, forming the Republic of the Philippines. A dramatic narrative that at last brings to light the critical role that U.S. Army nurses played throughout the war on the frontlines with grit, humor, and great heroism. A long overdue work of history and a powerful tribute to these women and their inspiring legacy. When evidence of sabotage on the USS Atwood is found, Ensign Jim Avery and Boston Navy Yard secretary Mary Stirling must work together to uncover the culprit.